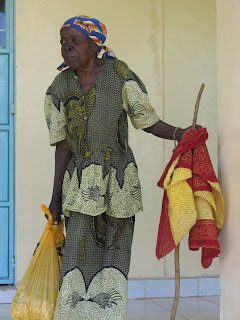 If you remember, we told you about a widow named Margaret, whose house was in deplorable conditions - an understatement (see blog dated September 25). 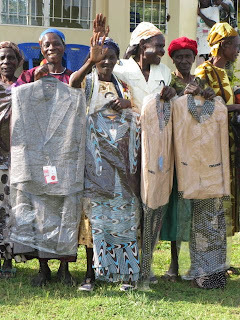 We had spent nearly all of the money we had been given for houses for two other widows. This was before any of us had become aware of Margaret's plight. Upon finding out about her dilema some good friends got in touch with us wanting to provide a roof for a new house for Margaret, and within a week and a half work began on the house because the things that required finances - the roof, a door, nails and experienced carpenters - became available. The house is so much bigger than what Margaret had "lived" in and has 2 rooms - the other only had one. This old widow was rather beside herself. She told the pastor that if God could take her out of the house she was in and give her a brand new house she surely wanted to worship him and wanted to come to church (she had not been before). Now, we hadn't seen her smile - yet! Then Hesbone, Violet, John and Marty went to the car to get the mattress, and sugar and bread we had bought her for a gift. (The bed she was sleeping on was indescribable). We got her photo and she was really smiling. We found out that she kept asking one of the cell group members (the only other person in the church with a vehicle) if that mattress was hers. He said it was. She asked again if it was her mattress. He assured her it was. She then told him that if he didn't take her to church on Sunday, when he got home she would beat him. As we were leaving they were all singing, clapping and dancing in celebration of the erection of the house. This is a very rural, rather remote place, but all of the people in the area became aware of what was going on! Real evangelism!! We are over the moon! We went back the next week and saw the finished product; finished, that is, in terms of the house being up and mud in all the orifices. The mud must now cure – it has to be thoroughly dry before the “plaster” coating can be applied. That is usually the woman’s job, but due to her age and frailty someone will do it for her – perhaps some cell members. She was a changed woman when we returned. She kept giving out little yelps and praising God and thanking us over and over. Wow! Once again we reap the benefits of sharing the joy of the blessings that so many other people have made possible by their contributions. Above: Margaret's bed & "wall" behind it! Yes - that is the outdoors that you see! She lived in this! Left: Margaret in front of house with mattress, and food. Below: One week later inside living room. This house is, for Margaret, a palace. She never dreamed of a home like this! 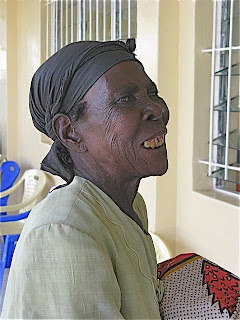 We are told that this woman probably wouldn't have lived much longer; life was without hope. Not only that, but she was exposed to the elements - rain and cold in the hills. This new house has literally made the difference between life and death. Thank you all so very much! Left: The floors will be finished after the walls are made smooth with another mud mixture - like plaster. The floors will be packed and then combed with aloe-vera leaves to make a design. THANK YOU AGAIN AND MANY BLESSINGS! FOOD DISTRIBUTION TO WIDOWS & ONE WIDOWER: Thanks to friends' generosity we had enough money to get some small food items for widows. We spent a morning packing bags with four 2-kilogram tins (about 9 pounds) full of maize (grown on the church property) 10 bars of soap, 2 kilos of sugar (a rare treat), a bag of salt, 100 grams of tea leaves, and a tub of cooking fat. We packed 100 bags. Next day 80 widows came to the church (in their best clothes). The rest was distributed later. What an amazing sight. Most of them came wearing their lesos – a large piece of material that is used for any number of things. It is tied around them like an apron. (We talked about them in the last blog.) When they received their food packs they spread the leso on the ground, put the pack(s) in them, tied them securely and hoisted them to their heads to carry. We don’t know how they do that. The packages turned out to be heavy, but, with few exceptions, they all carried them. Now there was one very old widow who came later and she just couldn’t carry the package. She lived near by so John said he would take it. We walked down the road with her and she sang, in Luo, all the way. She was singing, amongst other things, “God is So Good”. She would intersperse her singing with a spate of conversation – mostly one-sided for we didn’t understand her. We have since visited her home. Her name is Alseba, she’s abot 4’9”, and is 89 years old. Then we had one widower - William. He's been a widower for about a year, and is a bit helpless. He was a very happy man when he received his food. A week later he came to church and came forward to commit his life to the Lord! The little widow - and she and John. As they were going to her house she conscripted a young lad on his bicycle to take the package the rest of the way. Happiness is a new dress! 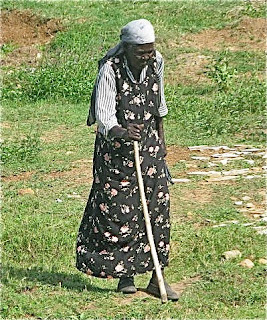 Below - a very old widow on her way to get her new dress. Since we were pretty certain that William wouldn't want a dress, we bought him a mattress; he had been sleeping on the floor. He was delighted! This will do for now! There is so much more to tell you all and a lot more that we are doing here. We will continue to update you well after we get back home. Please receive our blessings and fondest wishes! GOAT PARTY: Because of the volume of goats and the logistics in buying and caring for such a large flock we have had to buy them in lots. We had the first goat party on Sept. 19. with 24 goats. There were all of these kids and their mothers or grandmothers. Because some came from many miles away we had sodas and biscuits (cookies) and then distributed the goats. Well – many of the mothers/grandmothers didn’t bring ropes. Hesbone fussed at them saying it was just common sense to bring a rope when one was getting a goat! (From Marty’s point of view that wasn’t necessarily built into a woman’s DNA.) We were concerned that this presented a dilemma. However, it is quite the norm, when getting a goat or calf to hold it by one front leg and lead it along (see photo). Didn’t seem to bother the goats one bit. But then – "the woman thing" kicked in quickly! Once again, the leso! Many women just took theirs off, made a noose in one end, and gave them to their child to put around the goat’s neck or leg. Oh, you should have seen the colourful array of leads these goats had. Then another issue arose. 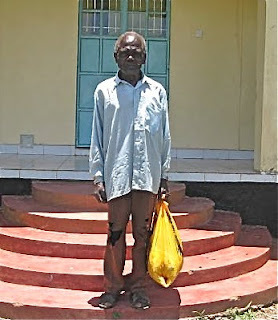 There is a relatively new cell group that comes from another village called Korowengi – it is a long way from the church and one of the leaders of the group has a pick-up truck in which they all pile every Sunday to come to church. This group arrived for their goats. There must have been 18 people in the back of that truck! When they were going back home there were 18 people and about 7 little goats. The laws of physics went into effect! So – about 3 women walked to the market where they would hire a piki-piki (a motor bike taxi), and 3 young lads – the oldest one 12 - who were proud recipients of goats set out on foot for home – about 4 miles away. The goats were then piled into the back of the pick-up, and then the people piled in all around the goats. We still don’t know how they did it and how they got home without anyone falling out! But, sure enough they were there on Sunday and no one had fallen out or been injured. Goats, women, men and children all made it home safely. In the photo the goats are in the bed of the truck and people are piled around them. We got another 34 to give.away on Oct. 3; ropes were provided (a hand made rope costs 15 cents (10 P). The next batch will be given on the 17th. Hesbone says these children will remember this for the rest of their lives. In the Luo culture there is something very important about being given your own animal and the responsibility for it. It is amazing to see what joy $22 (£14) can bring. The mothers and grandmothers were elated. Of course most of these kids are orphans - either have lost their father or both parents. On Oct. 3rd we were giving them out at 8AM. We got there early and on the way we met Charity - a little girl in a yellow dress, with a rope in her hand - walking to the church to get her goat. We gave her a lift and although she was shy, her excitement came through. She probably hardly slept for the anticipation. GOAT HELPS SAVE MARRIAGE! The pastors and leadership team of the Magwar church went to one member’s house and prayed for the her marriage.. Her husband has had nothing at all to do with her for quite some time; he moved out of her house and has spent all his time with the co-wife. (Polygamy is common amongst the Luos, so this fellow has two wives and has totally rejected his first wife for the younger co-wife.) Within a few days after prayer the husband began to come by the home to visit occasionally. Well, their grandson, who is an orphan and lives with her, was one of the children who received a goat. When her husband came by to visit and saw the goat he immediately wanted to know why the wife had brought the goat into the compound and where the goat came from. (Traditionally a man is supposed to lead any animal into the home compound, but since there was no man she had to do it.) The woman explained that the goat was given their grandson by the church; explaining about the two missionaries who came, and that goats were being given by the church so children could breed them, sell the offspring and milk, and buy uniforms and books in order to go to school. The man was stunned. He said he never heard of a church that would do something like that. He wanted to know more about this church. He has now taken on the responsibility of overseeing the rearing of the goat by his grandson. He comes by every day to bring grass to feed the goat. He has been spending a lot of time with the wife and true reconciliation is taking place. A huge thank you to all who gave donations for goats! We bless you so much for what you have done! We only wish you could share in the joy of seeing these children as they receive their goats. COW SHED KITCHEN: One weekday when we were working at the church the ladies cooked a meal for us. They cooked it in a couple of locations. One kitchen where it was being cooked on an open fire was a little building that serves as a shed for the calf as well. Not an uncommon thing to do. (It was also a temporary goat shed on the 3rd. of Oct.) The ladies have told Marty they will teach her how to make fire and "push" it. The village women prefer the open wood fire with their pot sitting on three stones, to the little charcoal burners- it is quicker. It is amazing what they can cook on those fires! BTW little girls know how make and cook on those fires by the time they are 7. LESOS (OR KANGAS) A leso (or kanga) is a large rectangle of very colourful printed fabric. It will often have a Kiswahili proverb printed on it. It is about 5 feet X 40 inches. Women usually wrap them around themselves over top of their dresses - it works like an apron. However, they are also used to tie their children to their backs (see photo), to sit on if one needs to sit on the ground or floor, to wipe the perspiration off one's face after a hard walk, or even to wipe ones hands or the baby's face, or to wrap parcels in to carry on ones head. As we found out, they can also be a lead for a goat! They are wonderful, multi-purpose pieces of clothing. Marty has several (of course)! Well - it is a long blog this time, but we hope you enjoyed it all.